DeQuervain’s syndrome causes pain over the distal forearm on the side of the wrist closest to the base of the thumb and may radiate into the base of the thumb. The cause is inflammation and swelling within the first dorsal extensor compartment which acts like a covering over the two tendons going to the base of the thumb. The Finklestein test that helps diagnose this syndrome causes severe pain when the thumb is flexed and the hand is bent away from the thumb. The inflammation and pain maybe treated several ways depending on the severity of the symptoms. Initially, splinting may be all that is needed. More severe symptoms may require anti-inflammatories and a steroid injection into the tunnel through which the two tendons going to the base of the thumb pass. Elevation and rest may also be of benefit. As a last resort surgery may be needed to open the tunnel. 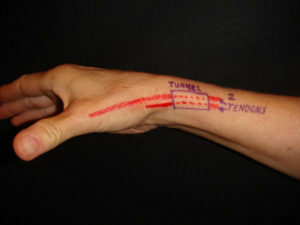 The incision is directly over the tunnel just above the wrist joint. This may decompress the area enough to completely eliminate the pain. Read more about De Quervain’s Syndrome HERE.